~~My Guilty Obsession~~: Celebrating Reaching 100 Followers! Get an ARC! That's right, I reached 100 followers and I am so excited and thankful to all my followers that I will be holding a giveaway for my ARC copy of After Obsession by Carrie Jones and Steven E. Wedel!! All you have to do to enter is be a follower (if you aren't one already then please start following!) and leave a comment below saying you would like to enter (this is open to international followers as well). 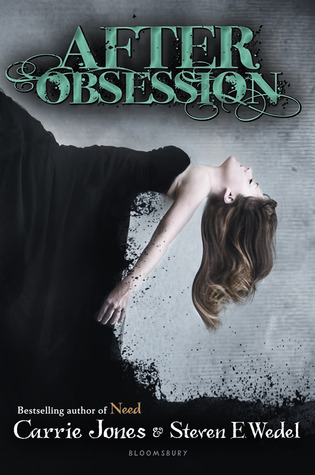 I will then pick one lucky follower to win my paperback copy of After Obsession which will then be mailed to them. I will run the giveaway from November 9th until November 23rd! Good luck to all that enter and thank you for being such wonderful followers!! Congratulations on reaching 100! This is a great giveaway. Thank you! I am sorry, I forgot to enter my email, I've been like that all day today, forgetful. Yeah you hit a milestone! Congrats! Whoops! Email; you didn't ask for it, but just in case you need it! I saw this book at BN a few weeks ago and i want to read it so much!!! Lol. I LOVE the need series and i can't wait to read this!! Enter me please!!! Congrats! Just wondering, is this giveaway international? If so, please enter me in! Yes it is international so enter away!! Congrats!!! And thanks a bunch for the giveaway! I love Carrie Jones & have been looking forward to this book!! Yay, congrats on reaching 100 followers! I really want to read this book, please count me in the contest! thanks for this awesome giveaway! I'd love to enter to win! Congrats on 100 followers! Now it's like 116! Anyway count me in! I hope i win! OMG amazing blog please pick me!! Congratulations!!!! Thank you so much for this wonderful opportunity! Congratulations!!! Thanks for all the reviews and time you spend keeping us up to date!!! Congratz on the wonderful followers awesome giveaway would love to read this book thx. I'm not entering the contest because I already have a copy of this very awesome book, but I wanted to stop by and say Congratulations on reaching 100 followers!! What a milestone! Would love to be entered, thanks for this giveaway! Congrats on 100 followers !! Congratulations! I would love to be entered for this book! Congrats on your now 130-something followers! Hi, I'm a new follower. Loving your blog! Great giveaway - count me in! I would LOVE to win a copy!!! I am a new follower but super excited to be here!!! Thank you so much for the giveaway and congrats on the milestone!! Good luck everyone!!! Congrats on hitting 100 followers! So exciting!